Who invented the Ferris Wheel? The name of the person credited with inventing the Ferris Wheel is George Ferris (1859 - 1896). George Ferris is not only famous as the American inventor of the Ferris Wheel but also as a builder and civil engineer. When was the Ferris Wheel invented? George Ferris invented the Ferris Wheel for the 1893 Chicago World's Fair, during the Second US Industrial Revolution / Victorian period of invention (1850 - 1914). Definition of the Ferris Wheel: The Ferris Wheel is defined as a rotating mechanism consisting of a giant, steel, revolving observation wheel with suspended, balanced seats around the rim that remain upright as the wheel turns providing a ride at an amusement park with a magnificent view of the fair. Fact 1: Who invented the Ferris Wheel? The Ferris Wheel was invented by George Ferris in 1893 during the Second US Industrial Revolution era of inventions (1850 - 1914). 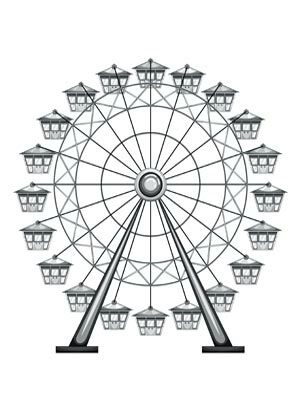 Fact 2: Who invented the Ferris Wheel? Prior to the invention of the Ferris Wheel in 1893, the Eiffel Tower had been constructed to give the visitors to the Paris Exposition of 1878 a fantastic view of the city - but nothing similar had been invented to create a similar stir at the 1893 Chicago World's Fair aka the 1893 World's Columbian Exposition. Fact 3: Who invented the Ferris Wheel? The American engineer George Ferris decided to build a giant, revolving observation wheel to rival the Eiffel Tower and provide visitors with a magnificent view of the fair and the city of Chicago. Fact 4: Who invented the Ferris Wheel? The inventor of the Ferris Wheel, George Washington Gale Ferris, Jr., was born on February 14, 1859 in Galesburg, Illinois, United States and died on November 22, 1896. Fact 5: Who invented the Ferris Wheel? The early years of George Ferris were spent in Galesburg, Illinois, United States where he was raised by his family. George Ferris was educated at California Military Academy and Rensselaer Polytechnic Institute in Troy, New York where he earned a degree in Civil Engineering in 1881. Fact 6: Who invented the Ferris Wheel? Following his education he worked on various civil engineering projects involving the construction of railroads and bridges. George Ferris proved to be successful in his chosen profession and went on to found his own company by the name of G.W.G. Ferris & Co. in Pittsburgh, Pennsylvania. Fact 7: Who invented the Ferris Wheel? A great fair was to be held in Chicago to celebrate the 400th anniversary of Christopher Columbus landing in the New World. It was called the World's Columbian Exposition but it would become known as the 1893 Chicago World's Fair. Fact 8: Who invented the Ferris Wheel? The 1893 Chicago World's Fair included educational exhibits, new inventions and was designed to entertain millions of visitors. The great event was to be located on the site of Jackson Park and the Midway Plaisance in Chicago which covered nearly 700 acres of beautiful parks and grounds providing exhibitions of new inventions, music, food, and various forms of entertainment. The entrance fee to the exhibition was set at 25 cents per person. Fact 9: Who invented the Ferris Wheel? Prior to the great event the Architect and Construction Chief of the upcoming Chicago World's Fair, Daniel H. Burnham, gave a speech to a group of engineers in 1890 who were interested in the Exposition, hoping to inspire enthusiasm for this colossal American project. Fact 10: Who invented the Ferris Wheel? George Ferris was amongst the eminent engineers who listened to Daniel H. Burnham's motivating words. Inspired by the speech, and the construction of the Eiffel Tower at the Paris Exposition of 1878, George Ferris hit on the idea of creating a massive revolving observation wheel to rival the success of the Eiffel Tower. Fact 11: Who invented the Ferris Wheel? George Ferris plan was to create a steel, revolving observation wheel that was 264 feet tall (80.4 meters), which was equivalent to a 26 storey building. Fact 12: Who invented the Ferris Wheel? George Ferris designed his "Big Wheel" to carry 60 passengers in each of the 36 cars (referred to as gondolas) that were 13 feet wide, 27 feet long and 9 feet high that swung around the wheel's rim. It was 825 feet in circumference and 264 feet tall. Fact 14: Who invented the Ferris Wheel? Other inventors and engineers scoffed at the idea believing the gigantic revolving observation wheel could never be built or operated. Fact 16: Who invented the Ferris Wheel? The invention of the Big Chicago Wheel was a massive undertaking necessitating the use of more than 100,000 parts to create the entire steel structure that weighed 4,100 tons. Fact 17: Who invented the Ferris Wheel? The Chicago World's Fair was opened on May 1, 1893 by President Grover Cleveland and closed on October 30, 1893 (Columbus Day). There were some delays in completing the amazing Big Wheel which was eventually opened on June 21, 1893, seven weeks behind schedule. Fact 18: Who invented the Ferris Wheel? The Ferris Wheel was a huge success and people flocked to ride on the great attraction for the price of 50 cents a ride. Each ride lasted for about ten minutes, making two complete circuits, and gave visitors a breathtaking view of Chicago World's Fair. Fact 20: Who invented the Ferris Wheel? After the Chicago World's Fair the Ferris Wheel was successfully moved to Chicago’s North Side where it remained for 10 years before it was exhibited again at the 1904 World’s Fair in St. Louis, Missouri. Fact 21: Who invented the Ferris Wheel? George Ferris tragically died of Typhoid fever at Mercy Hospital, Pittsburgh, Pennsylvania on November 22, 1896 - he was just 37 years old. His beloved Ferris Wheel was eventually dynamited on May 11, 1906.